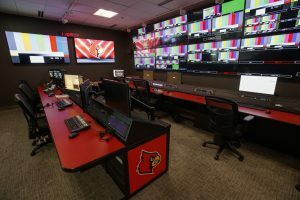 The University of Louisville is the latest ACC school to nail down preparations for the upcoming launch of the ACC Network. Some, notably Duke and the University of Pittsburgh, have made substantial changes to their facilities. 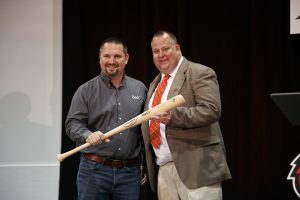 The Cardinals, however, took it to the next level, constructing a brand-new facility formally named the University of Louisville Athletics Broadcast Center on the far northeast side of campus. In addition to exceeding ESPN’s requirements for the network, the structure lived up to the university’s expectations as well. Before the first move toward making the university’s vision a reality, Noe did his due diligence and researched all the specifics. To see what other schools were doing, he trekked to other control rooms instead of discussing the matter over the phone. 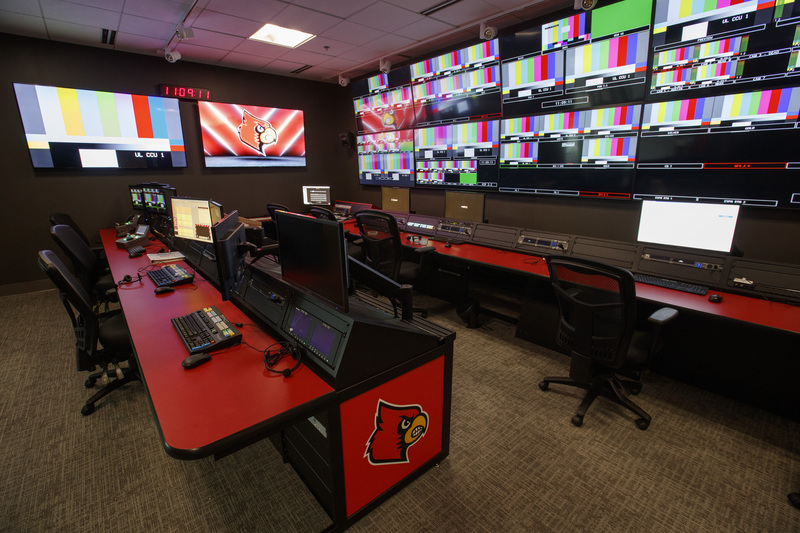 The three-studio setup allows the UofL to present 176 shows for the ACC Network on ESPN. After getting some help from Anthony James Partners (AJP) as the primary consultant for the procurement process, Noe sought a systems integrator that matched his work ethic. After he did even more research, the university selected BeckTV, and that company’s senior engineer, Paul Nijak, signed on to take the lead. 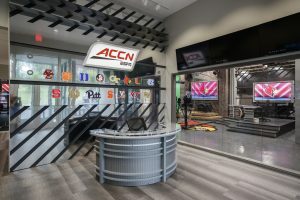 Four control rooms facilitate at-home productions of all athletic teams across campus. Actual construction began in February and concluded in time for the grand opening on Labor Day weekend. The $8 million, 7,850-sq.-ft. broadcast center houses four separate control rooms and a wide range of equipment. As at other ACC schools, BeckTV installed an Evertz DreamCatcher replay system and EQX router and four Ross XPression graphics packages (two for each linear control room). Besides studio programming, Ross XPression will also power the in-venue videoboard. Other Ross products include a Carbonite Black 3M/E video switcher and a Tria video server. When it comes to sound, Beck integrated Yamaha CL5 audio boards to handle the job. For production, Noe purchased a total of 28 cameras. Inside the broadcast center, the team has 10 Ikegami 99c cameras with Canon lenses: four with 80X, two with 14X2 wide angles, and the rest with 24X ENG standard. Tripods for these cameras were supplied by Vinten. Other specialty cams include three Marshall POV kits, nine Sony BRCH800 robos, and a wireless RF from Wave Central. 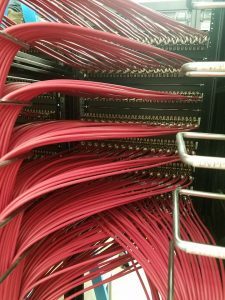 The coax cable bundles inside the broadcast center. With an already hectic schedule, including an increase from 80 studio shows a year to 176, Noe needs to be able to cover all athletic events at once. The biggest technical transformation, an expansive fiber network both inside the facility and to 12 of 13 venues, makes that job possible. The team uses more than 38.6 miles of wiring to connect the in-house equipment. For productions outside the building, 576 strands connect Cardinal Stadium (football), Dr. Mark & Cindy Lynn Stadium (soccer), Jim Patterson Stadium (baseball), Ulmer Field (softball), and other venues on campus. The KFC Yum! Center, home to men’s and women’s basketball, is the only venue not connected to the fibered infrastructure. Located in downtown Louisville, the arena is a state-run building. According to Noe, the team will begin pulling fiber from the location two weeks into the basketball season. Until then, a 26-ft. mobile unit owned by the university will be producing games on the hardwood. In addition to fiber connection, the team is staying verbally connected with the help of RTS Intercom Systems. With 26 Roameo wireless beltpacks, the connection is able to reach reporters conducting live hits in the parking lot during football telecasts.